It’s definitely been a long time coming. We’ve been hearing rumors about the existence of the device for quite some time. We’ve been seeing leaked images doing the rounds on the Internet for almost as long. 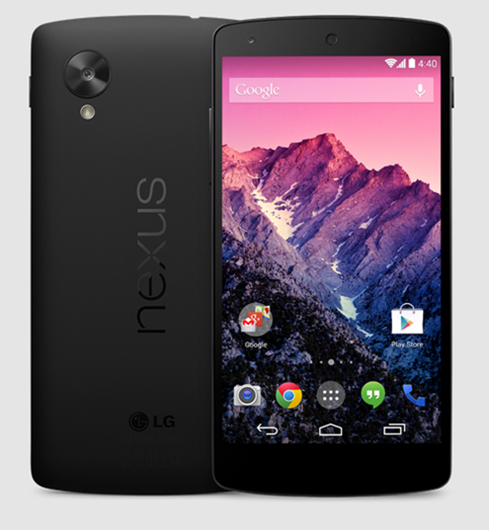 Thankfully, we no longer have to speculate on the existence of the device and its technical specifications as the LG-manufactured Nexus 5 has now been officially announced by Google. 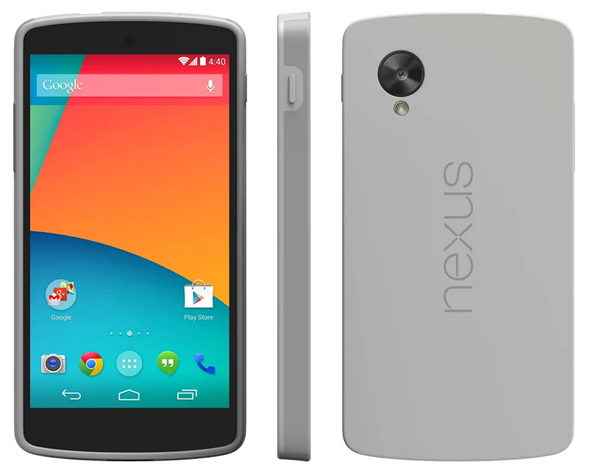 Now that the attention surrounding the iPhone 5s has died down, it’s a perfect opportunity for Google to introduce the successor to the Nexus 4 that proved to be such a successful smartphone. 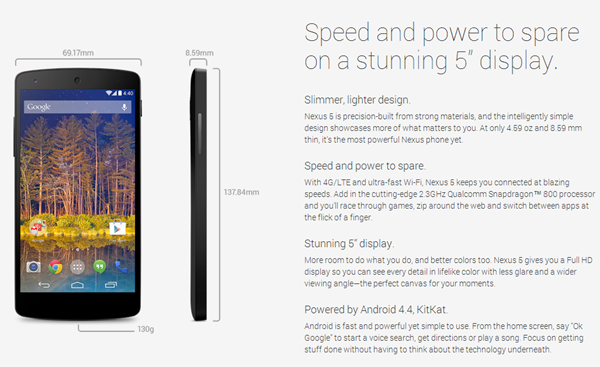 The device will be shipped running the latest version of Android – which is Android 4.4 KitKat – and manages to pack a pretty epic technical feature set underneath the 4.95-inch display. Anyone involved in the consumer technology industry should already be aware that it’s extremely difficult to keep secrets about upcoming devices these days. 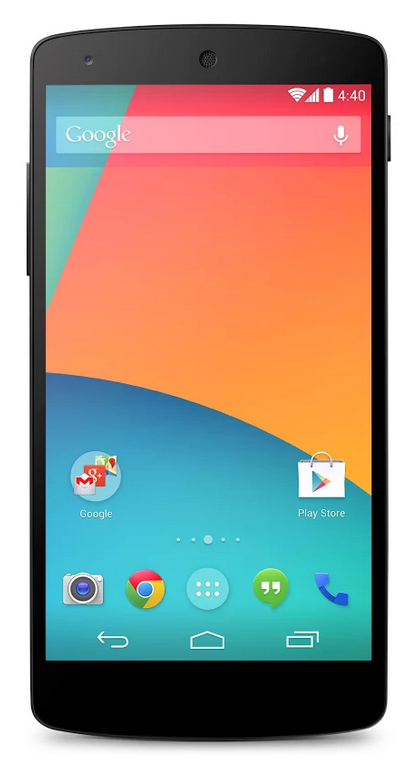 Google themselves even managed to let a few secrets slip during a number of promotional videos so it shouldn’t come as any great surprised that most of the leaked details about the Nexus 5 have turned out to be true. The gorgeous new smartphone will be powered by a 2.3GHz quad-core Qualcomm Snapdragon and benefits from a substantial 2GB on RAM. 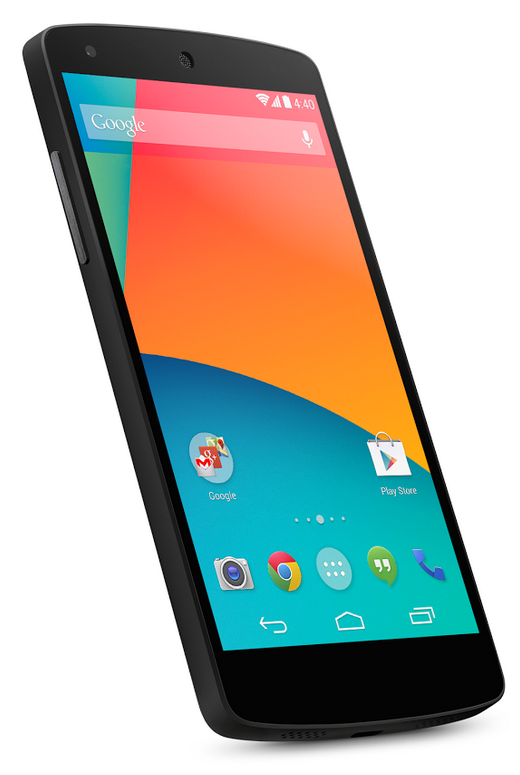 As previously mentioned, the Nexus 5’s main focal point will be the gorgeous 4.95-inch display that is capable of displaying full 1080p high-definition content. That whopping processor and vivid display will be powered by a 2,300mAh battery, and if you aren’t a fan of having wires running all over the place then it’ll come as a relief to learn that LG and Google have gone down the route of integrating wireless charging into the Nexus 5. Rather than opting for Bluetooth LE or NFC technology, the tech partnership have integrated both. Great news. The varying levels of connectivity proves that Google and LG are serious about giving users as much opportunity as possible to connect to the devices around them. The embedded rear 8-megapixel camera works perfectly in conjunction with the 1080p display and perfectly compliments the forward-facing 1.3-megapixel offering that will be used for those ‘selfie’ shots and video based calling. The camera now features optical image stabilization, and Google promises that it will be able to take shake-free shots. And to top things off, the camera features HDR+, which takes a handful of shots and combines them into one single photo. What does that mean for the average user? You get glorious shots during the day, and less noisy shots at night. A big win for photography fans here. No new smartphone launch is complete without official accessories and Google hasn’t disappointed this time around either. 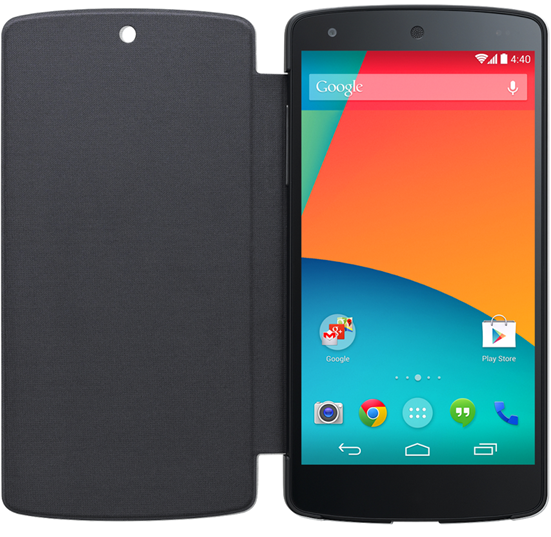 Google have also announced a bunch of accessories for the Nexus 5, and the first one is a Nexus 5 Bumper Case, and is available in four colors. The second is the LG QuickCover for Nexus 5, which takes design queues from Samsung’s Flip Cover, but comes without a window opening for viewing notifications, and comes in black and white. The $349 price-tag should do little to put the punters off this fantastic little device, with the great news being that it’s available to purchase on the Play Store now for AT&T, T-Mobile and Sprint customers. The $349 price tag is for the 16GB model, while the 32GB iteration will set you back $399. 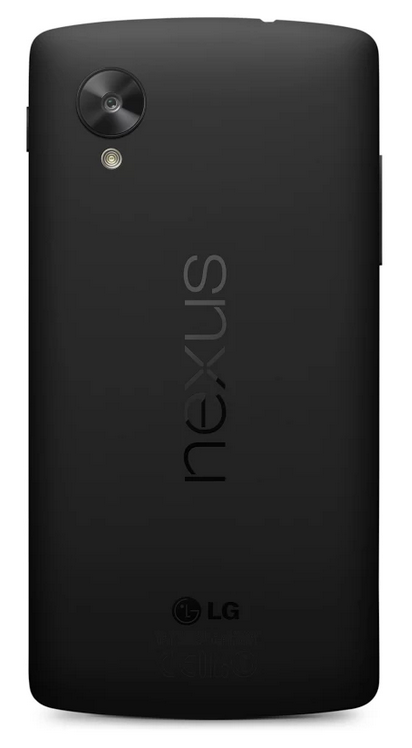 And the Nexus 5 comes in two colors, Black and White, and both are priced the same. 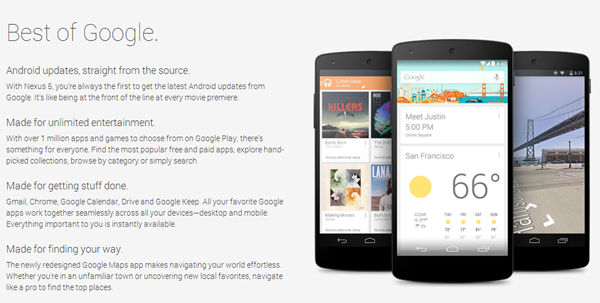 As mentioned above, the Nexus 5 is available to purchase right now directly from the Google Play Store, absolutely contract free. The device is available in the US, UK, Canada, Australia, France, Germany, Spain, Italy, Japan, Korea and coming soon to India.